“Ann” fell on hard times after she made a bad investment. 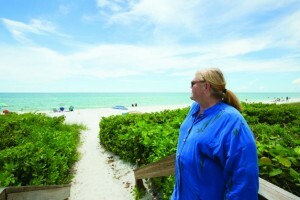 Photo courtesy of Gulfshore Life Magazine. Naples is a wealthy beach resort town on Florida’s Gulf of Mexico coast but appearances can be deceiving, according to this article in Gulfshore Life magazine. Behind the beach-front hotels and restaurants and luxury condos many elderly people are living in poverty, partly because of the economy but also due to poor financial decisions, bad health or bad luck. National Association of Social Workers member Thomas Felke, DSW, a social work professor at Florida Gulf Coast University, decided to do a study to get the full scope of the problem. He found 2,370 seniors in Naples and the surrounding area were living under the poverty level and 1,216 needed food stamps (The population of Naples is about 20,500). Felke is trying to do further research to find out how some are managing to survive. He hopes his data will alert elected officials that poverty is a serious issue in the affluent town. To learn more about how social workers help people who are elderly overcome life’s challenges visit the National Association of Social Workers “Help Starts Here” Seniors and Elderly website.